This is the second in a short series of articles about taking an introductory gun dog class run by The Friendly Dog Club over summer 2018. To see how we did in the first lesson, click here. After a fun first session, I was really looking forward to continuing introductory gun dog training with my 8-year old English cocker spaniel Amber. We’d spent the week practising with the whistle, this being a new facet to our training arsenal. On walks, I’d been blowing “peep” to get Amber to stop and sit, just as we did in the first lesson. However despite our hard work, we nearly didn't make it to the class as Amber fell victim to a grass seed that nearly completely entered her foot! The vet said the situation was close to having to knock her out and perform invasive surgery. Luckily he was able to remove it without having to resort to such drastic measures! This meant, however, that Amber was on a strict "no grass or sand" walking regime whilst her paw healed. 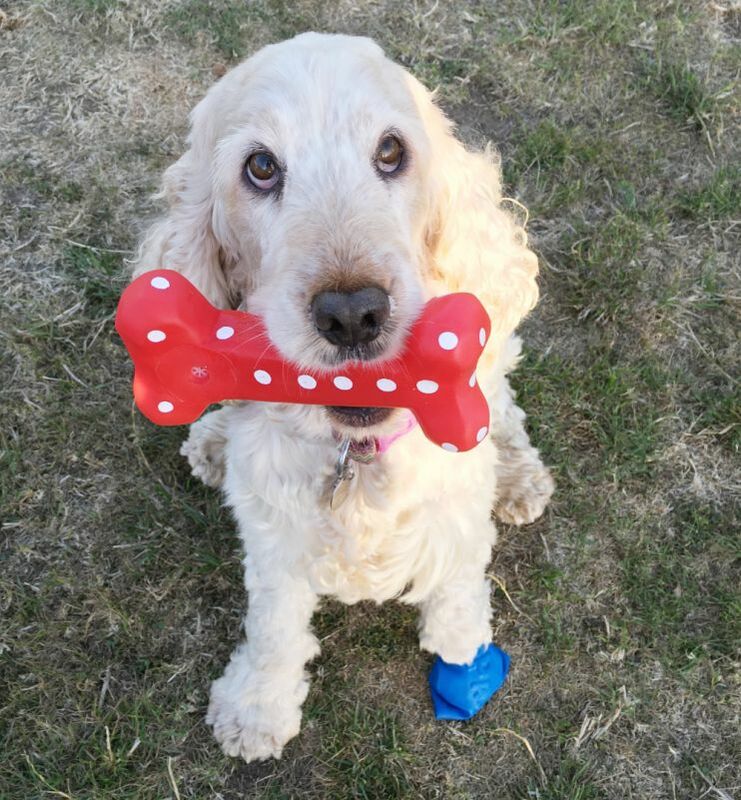 I desperately wanted to attend gun dog school, so after several failed attempts to find something that I could put on her paw for the duration of the lesson, I discovered a balloon-like foot covering that was the only thing that didn't come off. Phew! Lesson back on! As anyone with a dog will tell you, they are not robots! They all learn in different ways and at different paces. My blue roan cocker, Misty, usually picks things up quickly. Amber, on the other hand, takes longer to grasp something but once she understands what’s required of her she can be trusted to keep doing whatever “it” is to a decent level thereafter (especially in return for some sausage). She even sometimes performs a task unprompted (“I’ll just leap on this mat over here as I’m sure to get a treat whatever that hooman actually wants me to do”). I must, at this point, put paid to the phrase “you can’t teach an old dog new tricks”. Just as it’s valuable to start training a dog as young as possible, it follows that if they’re willing to learn then you can carry on in that vein for their whole lives. Misty is 11 and Amber is 8, both are “senior citizens” if you take any notice of such things, however both continue to enjoy all the training that’s thrown at them. It doesn’t half wear them out these days, though! We turned up for week 2 of the introductory gun dog class ready to throw our all into this week’s tasks. After a quick practice of the sit-when-blowing-the-whistle basics from last week we moved on to something new. We were given a toy to throw as we walked along in the hope that our hound would ignore it. Here’s where Amber’s focus is quite useful as she took no notice of what I was doing with the toy, most likely because when I threw it, it was no longer near my treat bag (see picture above). Apparently this is a precursor to something called “Bolting Rabbit” which is a piece of distraction equipment meant to really test your dog’s focus. That sounds like fun! I can’t wait to have a crack at that. Next we had to take our toy, walk around for a bit and then drop it so that our dog would see where it had been left. This is a memory test to see if we can send them off to find and return something. This week we began looking at the formal retrieve, a crucial part of any gun dog’s repertoire. This is throwing out a retrieve article (a toy, or ball or whatever your dog will carry) but asking them to wait as you do so. 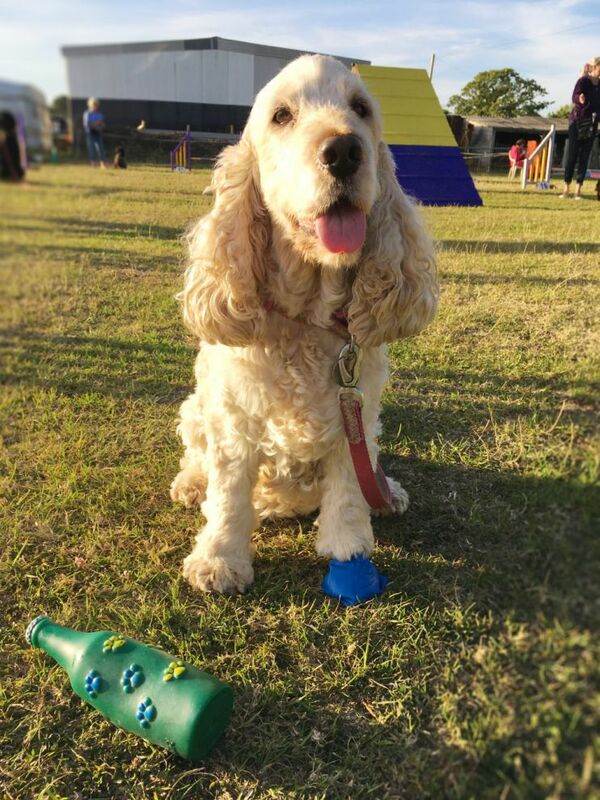 You should then be able to send your dog on command to fetch the item, return it to you and sit in front until you’re ready to take it off them (see photo at the very top of this post). Being that much older than many of the dogs on the course, this is something that I’ve been training Amber to do for some time. If I’m being brutally honest here, the main reason I’ve expended so much effort over the last few years perfecting this task with her is because my other dog is very reluctant to pick anything up at all. For this very reason I started retrieve training with Amber when she was a tiny puppy. She really took to it and although I’d like to take the credit for her aptitude at this task, it’s just as likely that she’s naturally very good it. She is a gun dog, after all. This week we extended the whistle training by trying to get the dogs to stop when they hear our whistle whilst moving away from their handler. That sounds tricky to me, and I can see how difficult it will be to get anywhere close to the standard of Gemma’s dogs, however all of the trainees did well for a first go. Gemma called the dog to her and then we had to blow our whistle to try to stop them in their tracks. None of the dogs stopped immediately, however as soon as the whistle was blown they quickly turned around and begin to head back towards their owner. Gemma said that is a great start and shows that we have our dog’s attention. I’m learning that focus is extremely important for gun dogs! I’m also practising sitting with distractions and having a go at that memory task, but this time doing it properly with an exaggerated and elaborate “chuck” of the toy right under her nose and a loud “oh look I’ve dropped your toy right by that tree, Amber” to really labour the point.